The satellite image above, from shortly after 9am this morning, shows the setup for the remainder of the day today as the Memphis metro area remains under a Slight Risk of severe weather (outlook map below). 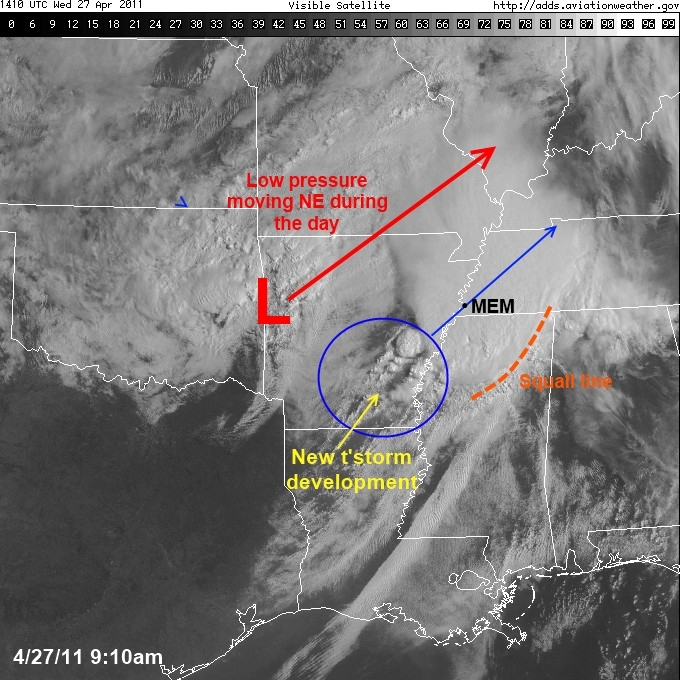 Low pressure over western AR will move northeast during the day. Behind storms over NE Mississippi, the atmosphere is re-priming over southern Arkansas and thunderstorms are developing and moving very rapidly northeast into the metro area (at 60-70 mph) thanks to a very wind aloft. Storms will continue to develop ahead of (east of) the track of the low and move through the area through early afternoon before a cold front will finally move through mid to late afternoon, bringing an end to the seemingly-endless severe weather of the past couple of days. Though we have been downgraded to a Slight Risk of severe weather, there is still a good chance many areas will see very heavy rain, dangerous lightning, large hail, damaging thunderstorm wind up to 75 mph, and isolated tornadoes. Flooding continues to be a major threat. We'll continue to update you on the risks today as they develop on Facebook and Twitter (links below). Tomorrow promises to be a much kinder day in the weather world!